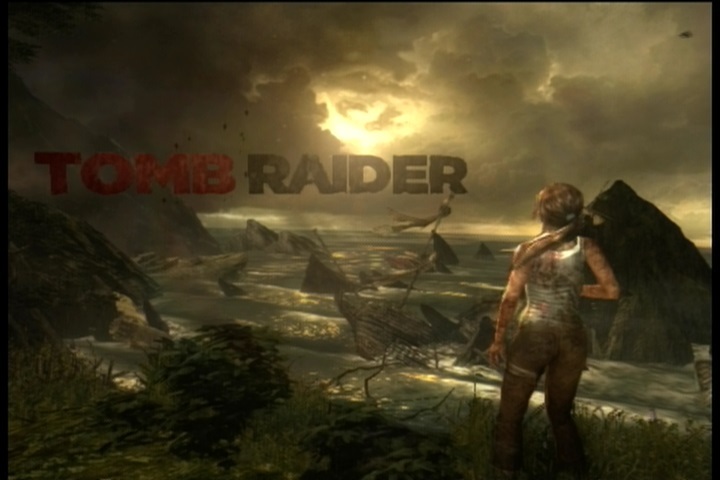 Though I had seen most of this sequence as part of the Tomb Raider footage shown at E3 2012 and beyond, I still thoroughly enjoyed playing through it within the context of the story. A series of Uncharted-style thrills and spills down a mountain lead to our heroine Lara Croft’s momentary pause inside the cockpit of a wrecked plane, flat on her back over a chasm and already quite bruised. The player can tell what’s about to happen from the camera’s positioning; the glass begins to crack and Lara reaches out in a desperate lunge to grab and fasten the doomed pilot’s parachute. The glass shatters and the first ‘chute fails to open properly; luckily the second billows out and the player must control Ms Croft’s adrenaline-pumping descent through a thicket of impossibly tall trees. Too many meetings with a stray branch will kill her. Even when you do make it to safe footing, you are forced to contend with controlling a crippled character who can no longer even jump because it hurts too much to do so. The harrowing sequence concludes when Lara finds a medical kit that includes a lighter. She heats one of her arrows, cauterises her wounds with an agonised scream, rests up and then promptly attaches the lighter to her bow, allowing the use of flaming arrows for the remainder of the narrative. I had to catch my breath after this one. Very late in the game Lara must face off against a force far more powerful than the cult she has concerned herself with for the majority of the story. Supernaturally animated Japanese samurai warriors begin to show up and put her survival and combat skills to a sterner test. These foes boast thick armour and powerful attacks, while mercifully not one of them knows how to throw a Molotov cocktail. The game’s longest instance of facing off with these beasts occurs amidst a run-down village covered in sand and ravaged by strong winds. What makes this moment so great is how big the arena is. Facing all of the creatures at close range all at once is nigh on impossible, as they won’t hesitate to whale on your spine while you’re trying to focus on offing one of their friends. So to defeat them you have to draw them away from one another, hiding around corners with shotgun ready, relying on your melee countering skills or taking a piece of high ground and kicking an explosive canister in their direction just before shooting it into oblivion. If you mess up an approach and end up caught between three of them, you’re able to cover enough ground to escape and regroup behind cover while the slow undead warriors struggle to turn around behind you. The sequence is the best example of strategy-driven open combat in the game, in my humble opinion. Generally speaking, however, the game’s combat is at its best when you’re able to effectively use the bow, which is the closest thing the game has to a sniper in that it’s stealthy and only takes one shot if you aim for the head. It also just feels good to use. 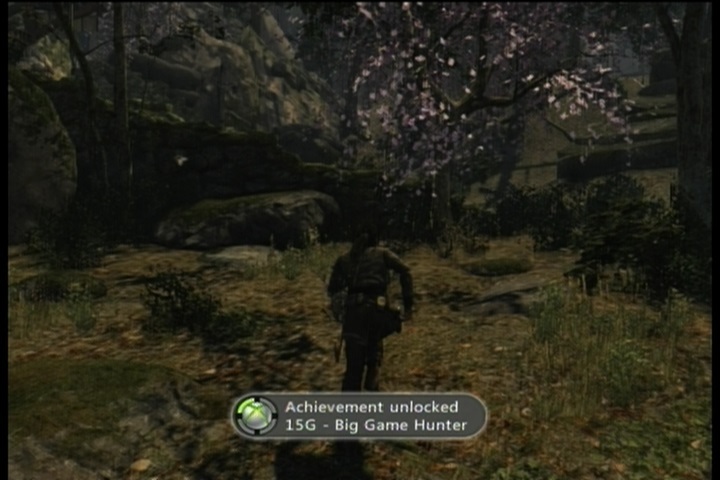 So the point in the game where Lara has to sneak around a heavily wooded area at night while generic mooks walk around with flashlights trying to find her is quite a lot of fun to play through. Everything from the positioning of the enemies and their sight lines to the bisection of the area’s geographical layout by a river to the way the light behaves visually all bear the marks of good design. Add in the satisfaction of a well aimed silent kill and you get my favourite instance of combat in the entire game. This decisive and altogether-too-short sequence at the end of the game is teased at earlier in proceedings, when an intentionally framed shot of two silver pistols accompanies the death of the patriarch of Lara’s expedition party. There would be few old school Tomb Raider fans, I’d wager, who didn’t wonder whether they’d get to see this new Lara Croft wielding her signature twin pistols at some point in the new game. Yet at some level the iconic image of the buxom, sunglassed Croft with a pistol at each side is a bit too silly to fit into Square Enix’s much grittier re-imagining of the character, at least this early in her survival-focused formation. So developer Crystal Dynamics invented a shrewd nod to older fans that simultaneously scratched their itch and put an exclamation mark on a villainous death that might otherwise have come off as a little anti-climactic. The game’s big bad, cult leader Mathias, is hell-bent on sacrificing Lara’s Japanese friend Sam to her ancestor, the island’s resident sun goddess Himiko. Lara won’t let that happen, of course, and so she scraps her way past plenty of mooks until she faces off with the man himself. It’s not a pretty battle, but as soon as our protagonist attains the upper hand she does not hesitate in making the most of it. She picks up a discarded weapon, which happens to be a pistol not unlike her own, and through a dual trigger quick time event unloads a storm of alternating bullets into the deranged pseudo-despot until he falls over a ledge to his death. There’s a brief shot of her peering after him, an image of power with a pistol at each side, before she drops the temporary weapon and heads for her friend. Clever. It might seem odd to place this here, but the marketing of Crystal Dynamic’s reboot of the Tomb Raider franchise is so heavily focused on gritty action that it may be hard to see past its dirt-and-blood-soaked QTE facade to see that it is still, at its heart, a Tomb Raider game. From the first time I ducked into an optional tomb and the game let me know what I had gotten myself into, I was immediately transfixed by the arresting dilemna before me. Presented with a seemingly inaccessible far-off platform, I was forced to think outside the box using my limited knowledge of what game mechanics had been revealed to me up to that point in order to create an unorthodox pathway. The next couple of tombs I encountered featured similarly organic mind-teasers, none of which were repetitive in their layout or too obtuse to figure out. There are only half a dozen of these completely missable tombs in the game, which means the puzzles stay unique and high quality, although they left me wanting more. When I look back on Tomb Raider in the future, these self-contained sparks of ingenious design are what I’ll remember most fondly. Of course, Achievements are always a highlight too. The tombs were pretty awesome, I wish there were more. I didn’t like the ending though, I wanted to kill Mathias myself 😦 I would say my second favourite bit was definitely the windswept samurai battle!